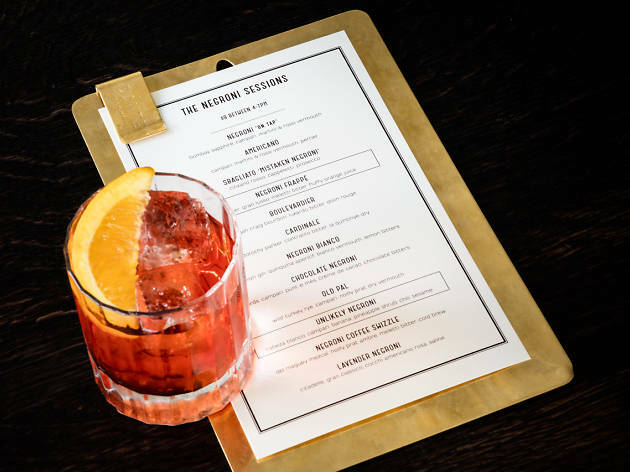 Overseen by renowned Sydney-born bartender-journalist Naren Young (AvroKO), the bar program centers on the European tradition of the afternoon aperitivo, which is showcased finely through a daily $9 negroni session from 4pm to 7pm. 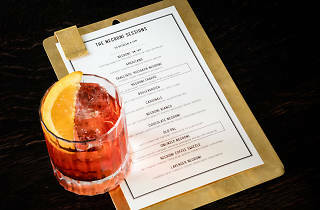 On a recent visit, a shaken negroni frappe proved more fluffy and refreshing than the original with dominating notes of citrus, while a cold-brew–laced negroni coffee swizzle allows even a subtle aroma of java to shine. 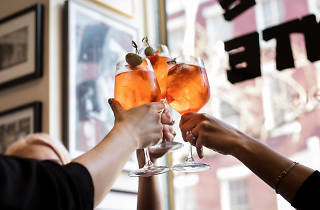 Beyond those classic variations, Dante’s house offerings include the simple yet photogenic Garibaldi ($12; Campari, fress-pressed orange juice) and a refined take on the classic Pimm’s Cup ($14). 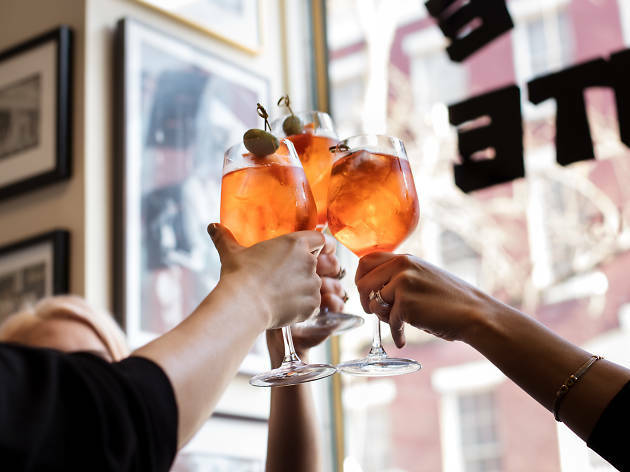 While the drinks are attention-grabbing, executive chef Rachael Polhill's health-friendly bar fare is certainly nothing to sleep on either. 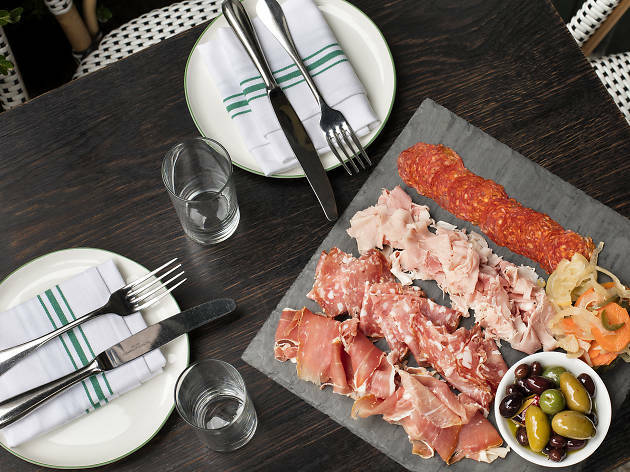 Composed of small plates, the menu is perfect for sharing. A starter of juicy heirloom tomatoes tossed with shallots, feta and watercress in a bright cab sav vinaigrette ($12) is simple, but the freshness of the greens make it worth ordering. A recent special of flatbread ($15) arrived with figs, peanuts and arugula on a thicker and more doughy slab of bread than the traditional crisp, with the figs providing a sweetness that nicely offset the nutty flavor. An orrecchiette, topped with a ramp pesto, spring peas, pine nuts, and tendrils ($17) is a clear standout, combining a fragrant, seasonal pesto with perfectly-textured pasta. 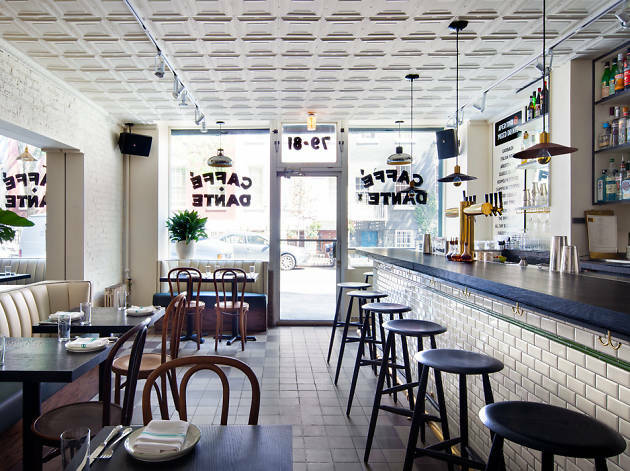 Dante’s appeal is simple and classic, yet cool and far from old-fashioned. Take a seat at the dark-wood bar or at a sidewalk table and you’ll feel why it’s survived in New York for 100 years. Dante is always packed to the brim with people. Great for dates or hanging with the girls, even bringing your parents before a comedy show. The staff is extremely knowledgable and the drinks are high quality! 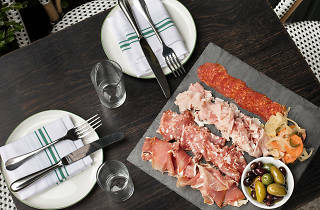 Dante is the perfect place for a date where you want to split a few things, or a girls night out. It has amazing cocktails and a really extensive list and everything from salads to veggies to heavier pastas. 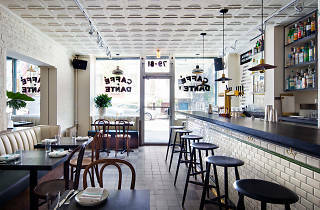 You could find something for everyone here but it isn't boring and has a delicious Italian flare. The waiters are also great at recommending food and drinks that go together. Such a great refresh on an historic venue... Cocktails are sublime and the food is even better! Not to mention proper coffees, a cappuccino with chocolate is the best. Love what they have done with this spot! !